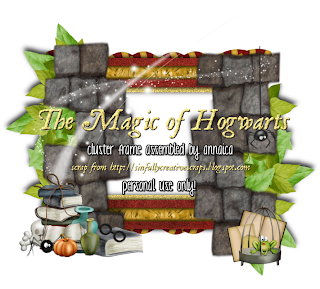 I made this cluster frame from the PTU kit called The Magic of Hogwarts by Creative Scraps by Crys. It is full of wonderful elements for all those Harry Potter fans out there, so be sure to check it out! Now, check out the animated tag I made! The non-animated PNG is pretty neat too :) I will teach you how to do both! 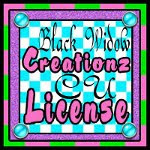 I found this tube over in the FTU tube share at one of my favorite forums- Creative Misfits! It is by Josh Howard and you can view all of his work on his site- www.joshhoward.typepad.com but you can use any tube you desire! I also used a couple FTU masks from the very talented misfits- you'll want to go grab the circle pack HERE (the one I used was chasmask37) as well as the sparkle n bling HERE (the one I used was SparkleMask4byTonya). 1. 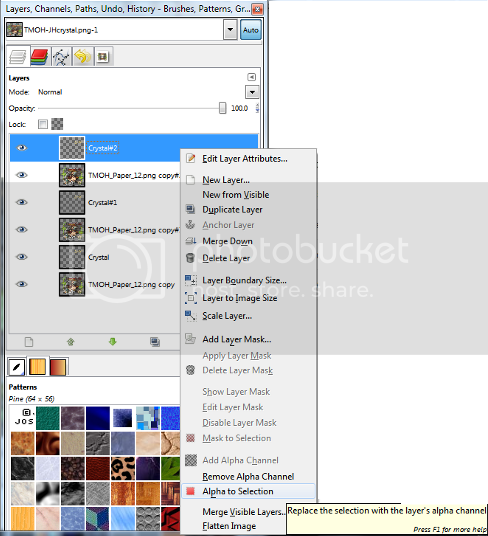 Open the cluster frame, then delete the top/copyright layer and the background layer. 2. Add your tube of choice. I used perspective for the shadow- just go to FILTERS>LIGHT & SHADOW>PERSPECTIVE with settings set at the values as shown in image below. 3. Add your copyright info for the tube- copyright symbol, artist's name and website as well as a license number, if applicable. Make sure it is clearly visible. I like to use a font called pixelette for my copyrights. 4. Add your background papers. I used 2 different papers from the same kit with which I made this cluster frame- The Magic of Hogwarts by Creative Scraps by Crys. I used paper 7 and paper 12. Just go to FILE>OPEN AS LAYERS to open them up OR you can click and drag them from their file on the computer to the canvas! It is often easier to do it this way. Right click on bothe papers and choose ADD ALPHA CHANNEL. Scale paper 7 to 360x360 and place to the bottom of the layers box. You may have to crop off some of this paper, just use the rectangle select tool to make a selection of where you want the paper to STAY, then go to SELECT>INVERT and EDIT>CLEAR to delete the excess paper. For the paper 12, you're gonna convert that into a mask, so read the next step to do so. 5. Open as layers both the masks I mentioned above. Click the little eye next to Tonya's mask to make it invisible for a moment. Now while on Chas's mask, go to COLOR>INVERT then LAYER>TRANSPARENCY>COLOR TO ALPHA. It should now be transparent. 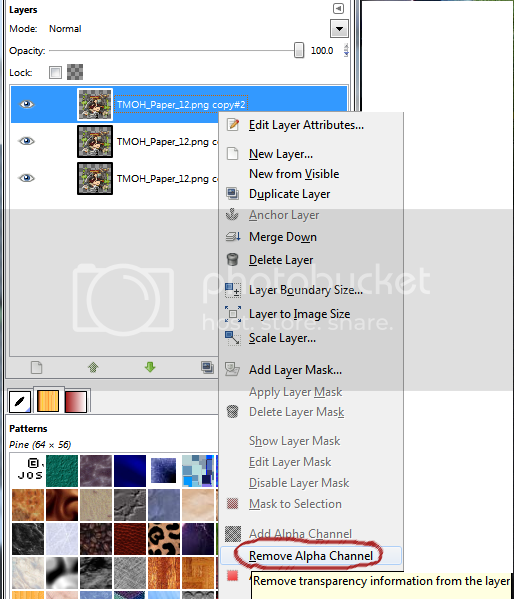 So right click on this mask layer in the layers box and choose ALPHA TO SELECTION. 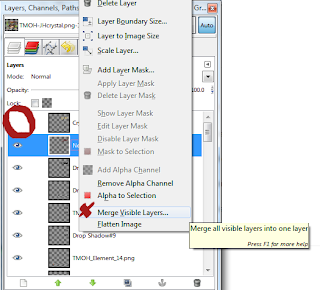 Now click on the paper 12 layer in the layers box to make it active... go up to SELECT>INVERT then EDIT>CLEAR. You now have the paper as a mask, so you can delete the original mask. Move this to the back, behind paper 7. Duplicate and place the copy on the other side of the tag. You can click the eye again to make Tonya's mask visible again. Follow the same steps as we just did to Chas's mask to make it transparent... Once it is transparent, go to COLOR>INVERT to make it white. Then add noise by going to FILTERS>NOISE>RGB NOISE with settings at 20/20/20/0. Scale this down just a little. Then make sure it is above the paper 12/mask we just created. 6. You can now add your name or text of choice. I used a font called JSL Ancient Italic in a shade I got from the golden hues of the cluster frame. Use the color picker tool to get this color just right. Also choose a maroon color for the next layer. Right click and choose ALPHA TO SELECTION on the text layer, add new layer and go to SELECT>GROW by 2 then fill in the new layer with the maroon shade. SELECT>NONE. Add a drop shadow by going to FILTERS>LIGHT & SHADOW>DROP SHADOW with settings at 2/2/5. Click back on the original text (gold) layer. Add noise to it but make sure that this is set at CORRELATED instead of INDEPENDENT RGB- only if you are not animating it... if you want to animate skip this part in purple. 7. Save your tag as .xcf so you can come in and make changes if you need to. Otherwise, when you're done with this one save as. png! To animate the text so it appears to be glittering, we have to click on the eye to make the gold text layer invisible. 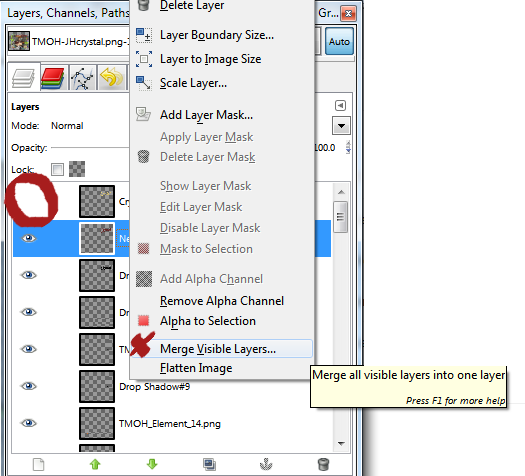 Then right click on any layer in the layers box and choose MERGE VISIBLE LAYERS, as shown in image below. And arrange them as shown in the next image. Right click and choose ALPHA TO SELECTION on the top text layer. Then add noise to it but make sure that this is set at CORRELATED instead of INDEPENDENT RGB with settings at 20/20/20/0 and all you need to do after that is just click on the next TEXT layer in layers box and go to FILTERS>REPEAT RGB NOISE, and then click on the third text layer and again, FILTERS>REPEAT RGB NOISE. SELECT>NONE. Make sure that your background color is set to white. Then right click on the top text layer and choose MERGE DOWN. Right click on the second text layer and choose MERGE DOWN. Right click on the third text layer and choose MERGE DOWN. 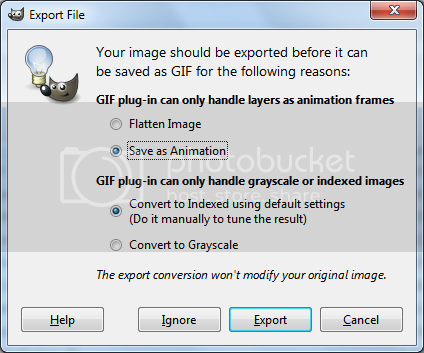 So, now your layers box should look like the image below. Right click on each of the 3 layers and choose REMOVE ALPHA CHANNEL. They will all have a white background now. 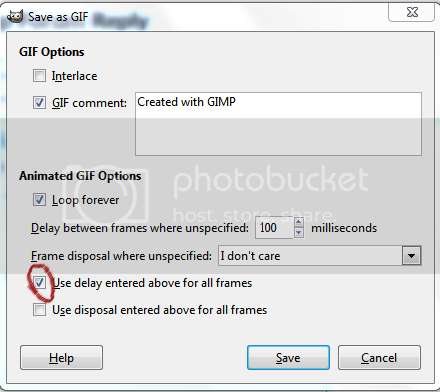 Go to FILE>SAVE AS and type in file name.gif (gif is for animations) and the window below will pop up, just make sure that SAVE AS ANIMATION is selected, then click EXPORT. Hope you enjoyed this tutorial, love to see your tags done with it! What a great tutorial! I love it!